Here’s a curious approach to guarding margins. 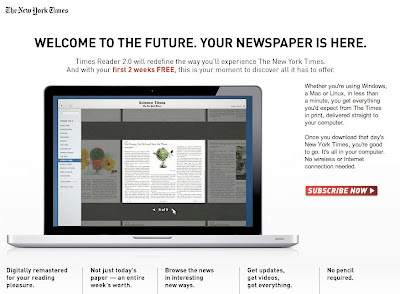 The New York Times is offering readers of its web site a special new way to view the newspaper on computers. “Times Reader” provides an iPad-type layout, with better graphics, intuitive swooping between pages, even an interactive crossword puzzle. Catch is this costs $240 a year. This is a classic example of differential pricing — the concept of charging different customers differently. It’s not unfair, rather a clever strategy to maximize revenue and margins. You see the inverse at grocery stores, where check-out clerks hand you coupons as you walk out the door. Some people, pinching pennies, will come back in with the coupon a week later and buy a can of soup for 50 cents off. You, likely in a hurry, won’t bother and will pay 50 cents more for the same chicken noodle broth. Because the “value” of the product varies for two people, the soup company has succeeded in charging two different people two different prices for the same good — maximizing its money while making you both happy. It’s a question germane to most businesses: How can we charge the customers who value us the most more for our service, while keeping everyone happy? By adding some minor differentiation (a la Times Reader) and letting customers self-select into the more costly service, you’ve built a path to higher profits. There are readers out there who love the Times who might enjoy the slick layout, and if they haven’t sprung $500 for an iPad yet, this is the only way they’ll get it. Of course, at $20 a month, save your money and you can buy an iPad in about two years. Ben I seriously need to stalk your blog more. You are becoming an excellent pricing intellect. I lived in LA for 17 years. Often I would buy the LA Times at the box across the street. Before coming into advertising I couldn’t figure how they could afford to fill this box with 5 papers a morning. When I connected the Advertising Support it clicked. Not long ago the NYT started charging $2 for the weekday issue in NYC. That is $700/year if you do not get Sunday. So $240 is a deal. It’s a huge cost savings passed on by the NYT for not having to kill trees, make paper, ship paper, print, ship paper etc. I tried the reader when it was first released many months back on Adobe Air. It’s really slick. Makes me think the News Industry screwed up with its formatting when it went Free online. Howie, thanks. Read Richard Thaler if you haven’t, he wrote the landmark paper on pricing strategies in the early 1980s. His team has a blog called Nudge. As far as the Reader, it is slick. I hate online layouts. I wonder if they make web site news layouts deliberately awful to push us to tablets or paid-for readers. hmmm.